I’m not sure how many times I traveled away from Winterset to teach or lecture about quilting over the years, but from 1993 to 2004 I kept a file titled Old Jobs. Scrolling through the document just now, I count one hundred and forty separate gigs, including Vermont Quilt Festival, Mid-Atlantic Quilt Festival, Quilt Colorado, Sisters Outdoor Quilt Show, and many guilds across the country as well as trips to teach in Australia, England, and France. Each invitation brought joy, as the booking enabled me to support myself and my family and confirmed that my quilting skills had value. After my partners and I sold Fons & Porter in 2006, I went on the road again from time to time, lecturing only, racking up some thirty additional trips. Just last fall rockstar quilters Victoria Findlay Wolfe and Paula Nadelstern came here to Winterset so we could present together on the stage of the Iowa Theater. 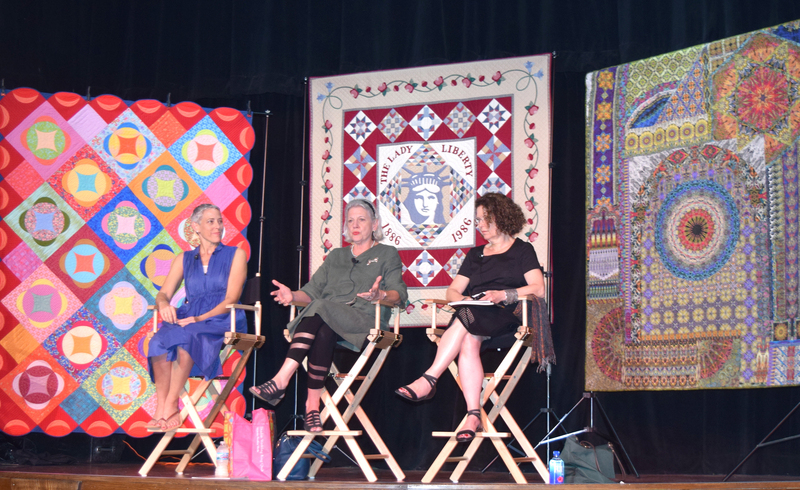 Working in the quilt world, I was always a quilter among quilters, talking quilt-talk, sharing tips for better patchwork—methods I learned via mistakes and successes in my own work. Now, I’m often a writer among writers, talking writer-talk, enrolling in classes at venues like the Iowa Summer Writing Festival and StoryStudio Chicago, participating in writers’ groups in Iowa and Wisconsin, and practicing the craft of writing—revising, re-writing, and un-writing in the same way I use my rotary cutter, sewing machine, and seam-ripper to carry a quilt from concept to completion. In April for the first time, I’ll receive a stipend for talking about writing to other hopeful, avid writers. That I’ll do so a hundred more times in the future is unlikely, but the opportunity to do it even once thrills me as much that first away-from-home quilt gig I accepted more than thirty years ago. It’s so much fun, isn’t it? Enjoy! You inspire me every day! Keep on growing and exploring. You go, girl! Congrats on the next chapter of your life. We’ll be watching you! I love watching your evolution, and admire your talents and dedication to your craft, what ever form it will take. You are an inspiration. Congratulations, I hope it is the 1st of many.